Muscles work in opposite pairs. Ideally both pairs should be equal in strength and flexibility. A pair of muscles has opposite functions. The iliopsoas and gluteals are opposing muscles. 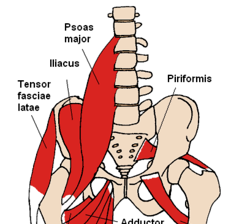 The iliacus and psoas are two muscles that comprise the iliopsoas, a hip flexor, and low back stabilizer. The iliopsoas brings your hips forward, while the gluteals bring your hips backward. To get an idea how these muscles work together, stand up and swing one leg forward and back without bending your knee. If your iliopsoas becomes excessively tight, your gluteals become lengthened, and can’t do their job. The imbalance affects the positioning of your pelvis, and the lower portion of your spine. When the iliopsoas and gluteals are working properly, they help to stabilize the pelvis and keep it in a neutral position. That means, your spine is balanced and healthy. Poor posture develops when the spine is not in neutral. Long hours of sitting at the computer, in a car, or watching television. Sleeping in the fetal position (legs drawn up toward chest). Poor Posture such as swayback (flattening of the lower back), hyperlordosis, (excessive arch in lower back), flatback (natural low back curve is flat), and kyphosis (excessive arch in upper spine). 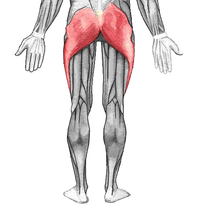 When the iliopsoas overpowers the gluteals, the pelvis is tilted forward increasing the arch in the low back. Human posture is considered healthy when the pelvis is in a neutral position, not tipped forward or back. From the side, the spine has three gentle curves (cervical/neck, thoracic/upperback, and lumbar/low back). When viewed from the back, the spinal column appears like a straight line. A healthy spine is pain-free. Pilates exercises are specific to correcting muscle imbalance, by returning the spine to its normal position. Pilates exercises are performed while maintaining the spine in neutral position. Participants who have difficulty holding the spine in neutral, are given modified exercises to help correct muscle imbalance. Special Pilates props and equipment are used, when participants experience difficulty performing the exercises. Posted on May 9, 2013, in Exercise, Pilates and tagged iliopsoas, muscle imbalance, Pilates, poor posture, postural imbalance. Bookmark the permalink. Leave a comment.